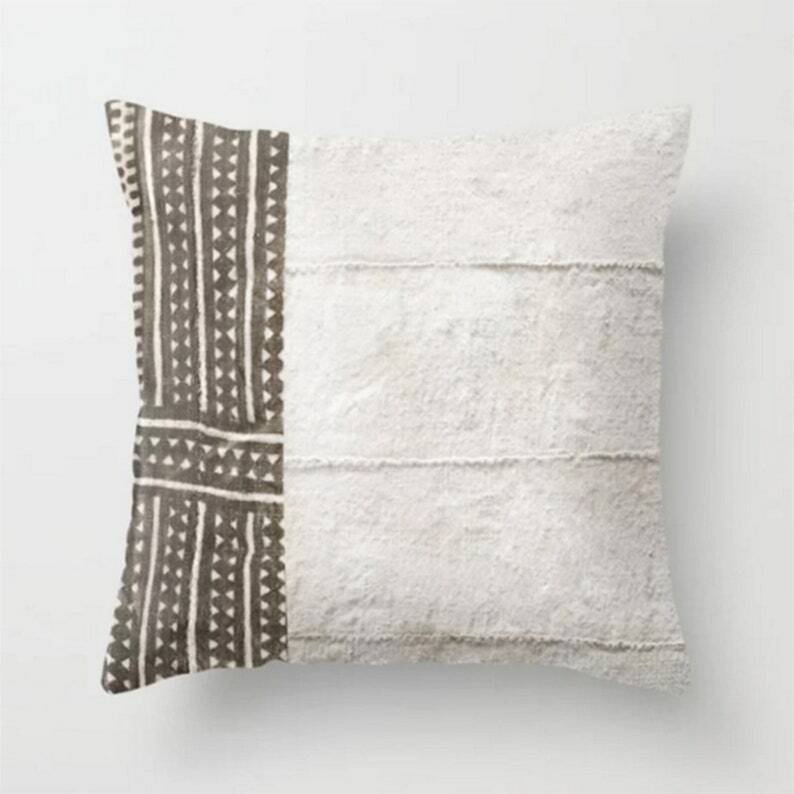 This pillow cover is made using one of the most distinctive textiles - mud cloth made by the Bambara/Bamana people of Mali, West Africa. Mudcloth is made of strips of hand-loomed cotton cloths that are hand-stitched together. They are softened and dyed in small vats of organic botanical dyes and painted with fermented mud. Imperfections in weave, dye, stitch, and design are intrinsic to handcrafted textiles and is part of the charm. We're happy to create and bring to your home, these beautiful one-of-a-kind pillows! The front of the cover are the pre-washed, antique and vintage mudcloth pieces; pattern placement may vary. The reverse side is natural unbleached 100% linen (wet sand). The cover is double-stitched, seams overlocked, stress areas and points reinforced. Finished with an invisible zipper for easy access and flexible styling, positioned on the side that has the solid off-white mudcloth. See drop-down menu for sizes. Quantity varies per size. Actual pillow cover may be slightly smaller (approximately 0 - .5"). ** All sales are final, so if you have questions, please ask prior to purchase. ** Made-to-order, yours will be similar to those shown in above photos. Follow us on Instagram @pillows_by_elissa to see sneak peeks of new items and special offers! © 2014-2019 Pillows By Elissa. All rights reserved. We accept all major Credit and Debit Cards as well as PayPal. We try to photograph and describe the pillow cover, particularly the fabric, as accurately as possible. We suggest that you request a swatch if you are uncertain. As for the fabric placement on the pillow, the pattern or design may vary from the photograph. This can be due to a number of reasons. 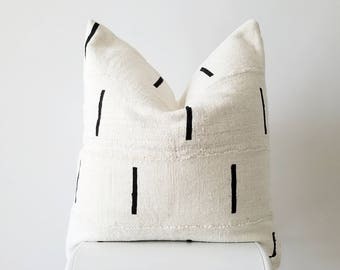 Aspects that cause variations include: size of pillow, cut piece, size of pattern/design in respect to pillow size, and the intrinsic characteristics of handmade textiles. Colors may differ slightly from photos due to variations in device screen/display settings. If you are uncertain about color or texture, please request a swatch. Vintage and hand-made items will inherently have inconsistencies in weave, stitch, and dye. These "flaws" and human touches add to its charm -- a "wabi-sabi" quality to be admired and appreciated. It is a quality that is embraced by collectors and discerning buyers. 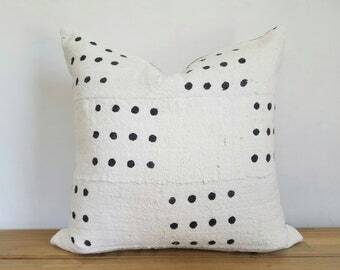 Due to the current trending of vintage tribal handmade pillows in mainstream decor, there is an influx of buyers that are following the trend, but still expecting items to have the quality of items from an advanced manufacturing facility. Please know that any discoloration, inconsistencies in weave or dye, remnants of batik wax, wavy, loose or inconsistent stitching, small holes, patches, repair stitching, a vintage, aged or home-spun/rustic appearance, are all assets and would not be considered a defect or mistake to warrant a return. If you have any questions, please message me prior to purchase. Unfortunately, we are unable to accept cancellations, returns or exchanges except in the case where a defect or mistake was ours, and could not be corrected. In the unlikely event that your order is damaged while in-transit, please send us photos of the damaged item and packaging. Please let us know immediately should you experience any of these issues, (within 3 business days) and we will be happy to work with you in resolving them. In an instance where we've decided to accept a return or exchange, the item must be in returned in its original, new, unused, and un-laundered condition, free of stains, odors, pet hair, and damage. Some returns may have a restocking charge. Pillow inserts can not be returned or exchanged due to hygienic reasons. Custom Orders and items on Sale are all Final Sales. Return shipping will be at the customer's cost. We do not accept items that arrive damaged or damaged while in-transit, so we suggest using USPS Priority Mail, which includes a tracking number, delivery confirmation, and insurance. We are also not responsible for returns that are lost in-transit, so it's advisable to have your package insured. Refunds will be granted for the item less shipping and any restocking charges, after the receipt of item in its original, new, unused, and unlaundered condition. U.S. Customers: We ship via USPS Priority Mail or First Class Mail. International Customers: We ship via USPS First Class Mail. When buying larger quantities, the shipping cost of your items may seem higher (in your cart), please do contact us, as we will do our best to remedy this situation by refunding shipping overages. For International customers, please note that all duties, fees and taxes are the responsibility of the recipient, and are levied once a shipment reaches the recipient's country. For more information, please contact your local customs office. We appreciate our customers for choosing to order our products - thank you so much! We love seeing your positive feedback as well as seeing our pillows in the wild - so please share, link or tag! If you have any questions, comments or concerns, please feel free to convo (message) us at anytime. Thank you for visiting our shop, and to all our customers, thank you so much for your continued business and support! Which size Boho Lounger® do you suggest? Depends on the person. Regular size is best for kids and anyone ~5'2" and under of normal weight. Large is good for anyone ~5'10" and under of normal weight. Xtra Grande is good for everyone, but it's really big and chunky and you'd need a large space for it. I like the Large size for myself and I'm just shy of 5'8"... You can sit and play video games in it...but to lay around and lounge in, the Xtra Grande is better. I personally like the Large better for interior decor reasons as well -- the scale works in most rooms. What filler should I use for my Boho Lounger®? Where can I get it? How much do I need? Some prefer the popular organic filler, buckwheat hulls, which you can also Google to find. Others use dry beans/grains, shredded wool/cotton batting or old clothes. Some types are heavier but the lighter types allow you to move it around easier and flip into shape easily. Convo for more info! Why are the zippers on my Boho Lounger® missing pulls? Please check through all the packaging documents that came with your Boho Lounger® as there should be Childproof Zipper instructions. Message us if you had misplaced them and we'll message you back a step-by-step detailed instruction!